The earliest written versions of “The Three Little Pigs” date back to Britain in the 1840s. It’s thought that the tale is sort of an updated version of “The Wolf and the Seven Young Kids,” in which the wolf tricks his way into the goats’ house and eats them, but their mother saves them by cutting the predator’s stomach open. And yes, this is basically the same idea that showed up in the Grimms’ version of “Little Red Riding Hood” as well. Maria Tatar proposes that the pigs originally being goats is why they refer so often to the hair on their chinny-chin-chins, which would obviously be more impressive on a goat. I have to wonder if there’s also a touch of Jesus’ parable from Matthew 7 and Luke 6 about the two men who build their houses on sand and rock, respectively. 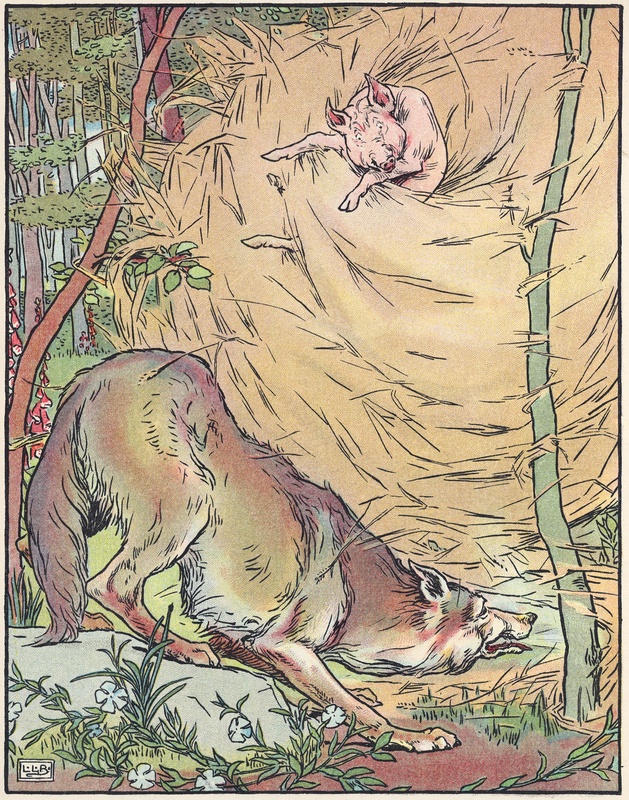 In some earlier versions of the fairy tale, the wolf actually eats the first two pigs, and the third pig eats the wolf after cooking him in a pot in the fireplace. Later, it became more common for the smart pig to take in his foolish brothers before the wolf could catch them, and to be less specific on the fate of the ravenous canine. The most famous audiovisual version of the tale might well be the 1933 Disney Silly Symphony, which names the pigs Fifer, Fiddler, and Practical. Those aren’t really that congruent, are they? Since Practical plays a piano (made partially of bricks), wouldn’t it make more sense for him to be Pianist Pig? While the Big Bad Wolf isn’t named in the short, he was later given the name Zeke. Reading about the cartoon reveals an interesting tidbit about how the wolf originally disguised himself as a stereotypical Jewish peddler, but the scene was later reanimated and redubbed to make it less offensive. For some reason, his line about “giving a free sample” was also changed to “I’m working my way through college,” which makes considerably less sense. The version I found on YouTube keeps the caricature Jewish nose, but also the “working my way through college” line, so it kind of seems like a grab bag as to what you’re going to get in any particular release. Also, notice Practical Pig’s pictures of the family’s father and mother. I wonder what happened to those four other piglets. This entry was posted in Cartoons, Fairy Tales and tagged bible, big bad wolf, brothers grimm, gospels, jesus, little red riding hood, maria tatar, silly symphonies, the annotated classic fairy tales, the three little pigs. Bookmark the permalink.